Crop Circle Clay - Finalist at American Made 2014 Home | About Us | Opportunities | Sponsorships | Contact Us! Today I am proud to exhibit the work of Diana Brower from Crop Circle Clay. 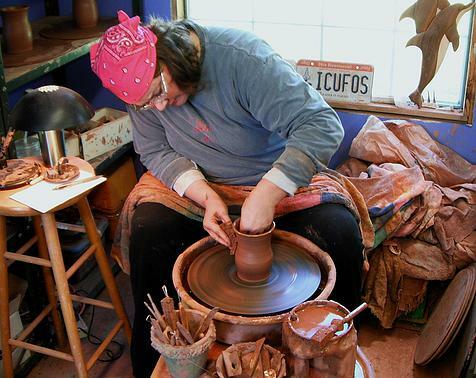 Diana is a passionate potter from Ohio and finds a hidden energy in the work she produces! 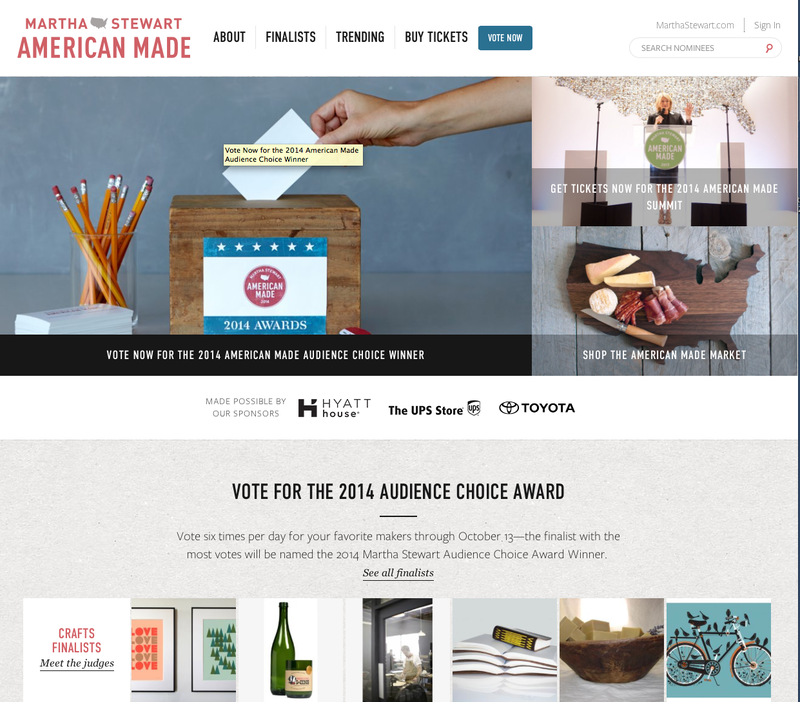 She has recently become a Wildcard Finalist in the Martha Stewart American Made Competition of 2014. Please visit her page at America Made and vote for her! 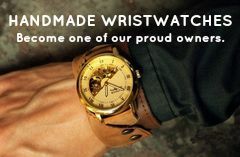 Diana, we at Handmade Men wish you all the best and hope you win the contest! 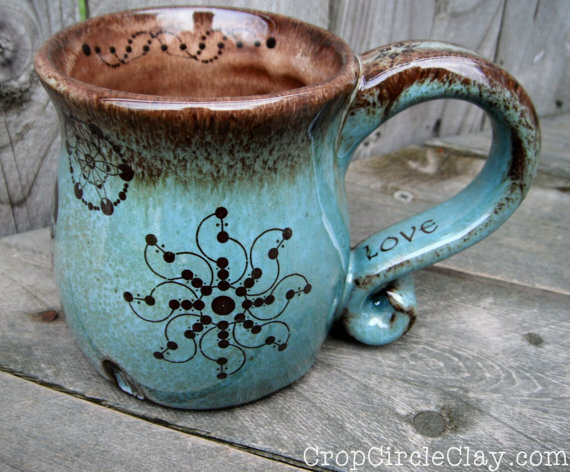 My coffee mugs are very popular and I love making them. At this time, my mugs are made-to-order until I can replenish my stock. 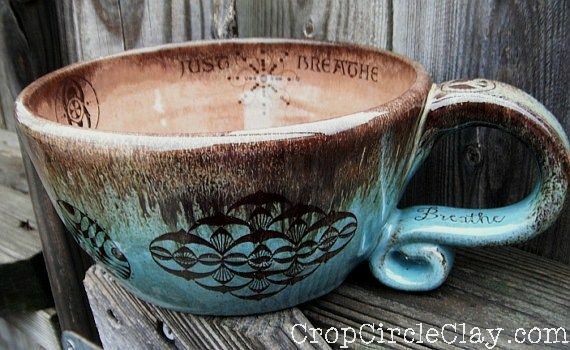 You can have a crop circle pattern on your mug, but you can also get them with Imagine Peace, Dragonfly or Henna Tattoo designs. 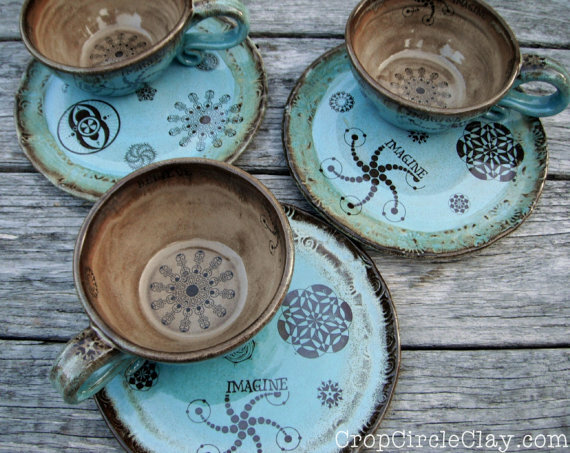 Large soup mugs are another favorite piece. I use mine everyday! They’re great for cereal, ice cream, soup, yogurt & berries and other snacks. I love creating everyday items that people love to use. I’ve had customers tell me that they have used their mug everyday for years. The pot becomes a part of their lives. I listen to my customers because they have great ideas! One person asked me to make her a small plate to go with her soup mug. I thought it sounded like a good idea, so I did it. Now, soup bowls & sandwich plate sets are very popular! I adore my new henna tattoo designs. They are simply lovely and women just adore them. 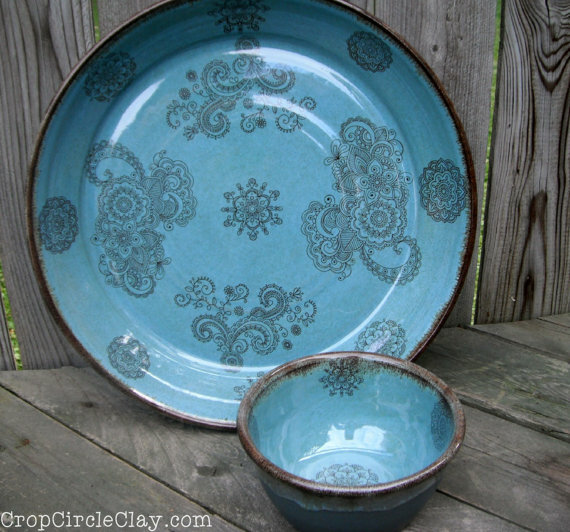 Here’s a platter & bowl set that features this design. 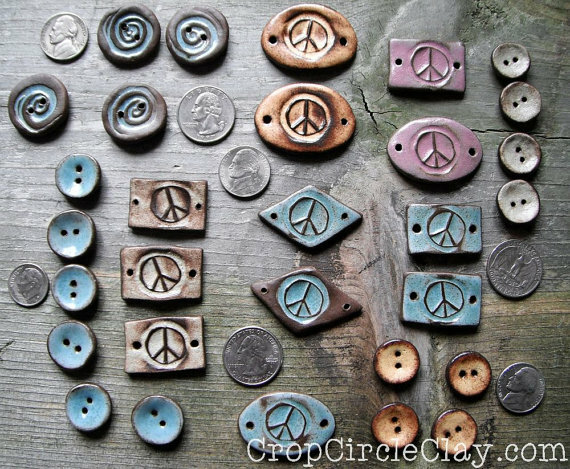 In the interest of stretching my wings, I also love to make ceramic beads as jewelry and buttons. I sell earrings and pendants and one of a kind buttons. Knitters and fibre artists love my buttons to enhance their own works of art. We have heard that you are a finalist in the American Made Contest 2014, tell us about your journey and how that makes you feel? A potter friend of mine from the Etsy Mud Team told me about the American Made contest in June. The deadline was the last week of August, so I pondered it all summer. I started the application process but didn’t finish it. Finally, the day before the deadline came. I decided “what the heck!” and finished my application and submitted my application with my photos. I learned there were over 3,500 applicants in four different categories; style, craft, design & food. I looked through some of the other nominees and was floored by the high quality of artists and craftspeople. WOW! That’s really a cool thing about this competition: I’m not only competing against other ceramic artists, but someone who makes macaroons in Brooklyn, or a fashion designer from Seattle. That’s cool and I’m very honored. A week after I entered I learned that I was a “Wildcard Finalist” and I was stunned. I got into the Finals because so many people ‘shared’ my profile. I wasn’t selected by the judges. There are 200 Wildcard Finalists and I don’t know how many juried finalists. There will be 10 winners and the winners receive $10,000 for their business and a trip to NYC to participate in the American Made Awards in November. Winners are determined thus, 9 will be chosen by the judges and 1 will be the People’s Choice. What is the most interesting custom design you have crafted? The most interesting custom design would be the Beer steins for Mumford & Sons. Labor Day Weekend 2013, the Mumford & Sons brought their Gentlemen of the Road Tour through my hometown, Troy, Ohio. It was so much fun!! Mid-summer I began designing mugs and beer steins for the event. The ‘gentlemen’ theme incorporates a man with top hat & mustache. I designed a logo featuring “Troy, Ohio” and “2013″ and had a rubber stamp made. (Of course, we weren’t allowed to use the GOTR logo). The City of Troy & Troy Main Street hired me to make 4 beer steins with this design to be included in a gift basket for the band! I didn’t get to see them receive their gift, I hope they enjoy them. Thank you, Charlie! I’m very honored to have been featured on your blog! Can’t thank you enough for your support.